For more than a year, CBM has been marketing spare parts for lifts for vehicles facilitating the Transport of Persons with Reduced Mobility (TPRM) of the DHOLLANDIA brand, the European leader in hydraulic tail lifts. With more than 45,000 units manufactured per year and a total of more than 625,000 tail lifts delivered since 1968, DHOLLANDIA is Europe’s leading manufacturer of lifts. Unlike many competitors who assemble pre-manufactured parts, DHOLLANDIA is a true constructor of tail lifts, manufacturing more than 90% of the parts used themselves. 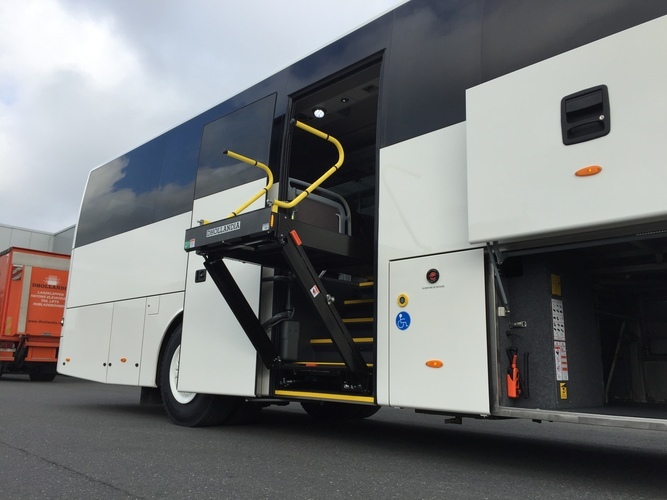 A market leader (with more than 50% of market share), DHOLLANDIA has also developed a range of lifts for the Transport of Persons with Reduced Mobility (TPRM) for coaches, and specialised vehicles allowing access to such persons under optimal safety conditions. The DH-CH100 and DH-CH101 models as well as the new 2016 generation of lifts, the DH-CH102 and DH-CH103, are the most popular in the fleet. They are fitted with a single-part, stable platform, eliminating as many components as possible in order to reduce maintenance. At CBM, we aim to meet the needs of public and private transport operators as efficiently as possible. Our scalable range is specifically designed for the optimal maintenance of transport equipment for all travellers, and can be adapted in line with technological and regulatory changes. That is why we have been selling spare parts for DHOLLANDIA TPRM lifts for passenger vehicles for over a year – from printed circuit board motors to cylinders, switches, lights, levers, relays and even remote controls.